Ambassador John Limbert AB '67, AM '71, PhD '74: Is There a Way Forward With Iran? Ambassador Limbert served as Professor of Middle Eastern Studies at the Naval Academy and is the former Deputy Assistant Secretary of State for Iran in the State Department's Bureau of Near Eastern Affairs. The U.S. and the Islamic Republic of Iran have spent the last forty years stuck on a "road to nowhere". The two sides barely talk, and when they do, exchanges consist mostly of trading insults, threats, and accusations. Those sterile exchanges have accomplished nothing, and the two sides remain in a downward cycle of futility. We have had a few tantalizing glimpses of a better way, one that can produce positive results for both parties. But whenever we seem to be making progress, we run afoul of the iron "law of the Medes and the Persians which alter not." Attempts to break the grip of these laws have so far been futile, in large part because both sides have forgotten some basic rules of diplomacy. There is clearly a better way, but finding it and staying on it has so far proved a serious challenge. 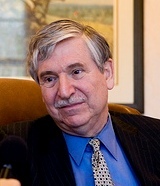 John Limbert is a retired Foreign Service Officer and academic. In 2018 he ended twelve years as Class of 1955 Professor of Middle Eastern Studies at the U.S. Naval Academy. During a 34-year dip­lomatic career, he served mostly in the Middle East and Islamic Africa (including two tours in Iraq), was Ambassador to the Islamic Republic of Mauritania, and served as Deputy Assistant Secretary of State responsible for Iranian affairs. Beginning in 1964, he worked in Iran as a university and high school teacher, and later served at the U.S. Embassy in Tehran, where he was held hostage in 1979-81. He has authored numerous books and articles on Middle Eastern subjects.